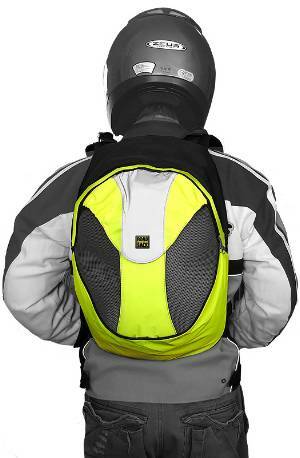 Innovative material use and backpack design make Road Sack wearing riders stand out in traffic and thus reduce chance being in an accident. With more and more road users than ever, the roads are becoming a dangerous place especially for two-wheeled vehicle riders (Motorcyclists and Cyclists). It’s not uncommon to see safety conscious riders wearing high-visibility vest to make themselves seen to other road users. Accidents occur between two road users (exhaustive study in Europe showed 80% of motorcycle accidents involve another vehicle*) when they don’t see each other. Anything you wear to make yourself stand out by use of colours, shapes, patterns and movement of these objects increase your road presence in traffic, dramatically lowering the likelihood of another road user making a manoeuvre that could result in a collision. 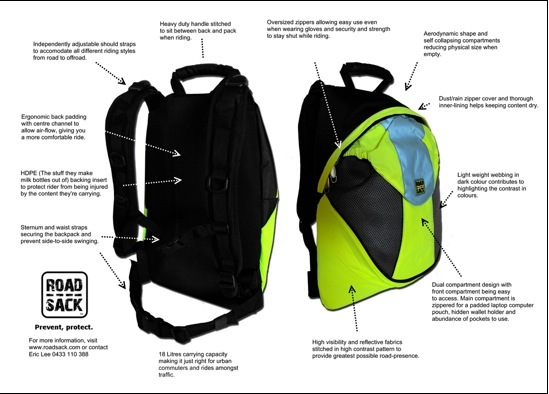 “The idea of Road Sack was born out of a desire to protect riders by preventing accidents from happening in the first place and protecting the rider if an accident occurs.” said Eric Lee, designer of Road Sack. Most riders invest substantial amount of money on purchasing accessories like a good helmet, gloves and riding boots, with the intention of protecting themselves in case of an accident. They do nothing to preventing the accident in the first place. • Prevent accidents – use of high visibility and reflective fabrics in high contrast patterns. • Protect wearer- straps and construction features designed to protect the rider in the event of an accident. • Ergonomic comfort and durability - appropriate padding & reinforcements at the right places. • Even load distribution - not affect your riding style or abilities. Road and Off-road. Motorcyclist and bicyclists. • For complete list of features visit www.roadsack.com. The Road Sack comes with a 12 months craftsmanship warranty and lifetime accident replacement guarantee. It is now available at selected retailers in Sydney as well as directly online at www.roadsack.comat $99.95 including free shipping. Based in Sydney, Australia. Road Sack is an innovative brand of Tradepedia Pty Ltd. Our products are designed by riders for riders. We’ve just introduced our first product to what will hopefully be a range of life-saving accessories for our two-wheeled customers. The Silver Wing's ample size, powerful performance and sumptuous comfort are well-deserving of its reputation as the luxury sedan of the scooter world, and now Honda has brought in a mid size 400cc version to further complement the range. The Silver Wing 400 offers remarkable performance and comfort similar to its bigger cousin, the Silver Wing 600, whilst also providing remarkable cargo capacity, thanks to a 55 litre under seat storage space. The heart of this new mid size machine from Honda is a powerful liquid-cooled fuel-injected DOHC parallel twin engine that pumps out easy acceleration with an every twist of its throttle. The V-Matic automatic belt drive transmission means there is no fumbling with a clutch and the result is an easy and linear delivery of power from start to stop. In fact, the Silver Wing 400 offers engine response that is considered by many to be superior to any other in its class with the output equivalent to that of a 500cc single cylinder. The Silver Wing's razor-sharp aerodynamic styling incorporates spacious riding accommodation, superb wind protection and all-day convenience. Its heavy-duty suspension and superior braking mean comfortable, confident control in all kinds of traffic, and with Combined-ABS available on the Australian version, the Silver Wing is one of the safest options on the road. It has been purposefully designed with a low centre of gravity making it highly manoeuvrable through tight city streets and suburbs. Capable of holding enough equipment for a weekend away, and with a broad, comfortable tandem seat, its possibilities extend well beyond the city limits. Honda's newest scooter also offers a HECS3 oxygen-sensing catalytic converter system that minimises harmful exhaust emissions, ensuring full EURO-3 compliance. 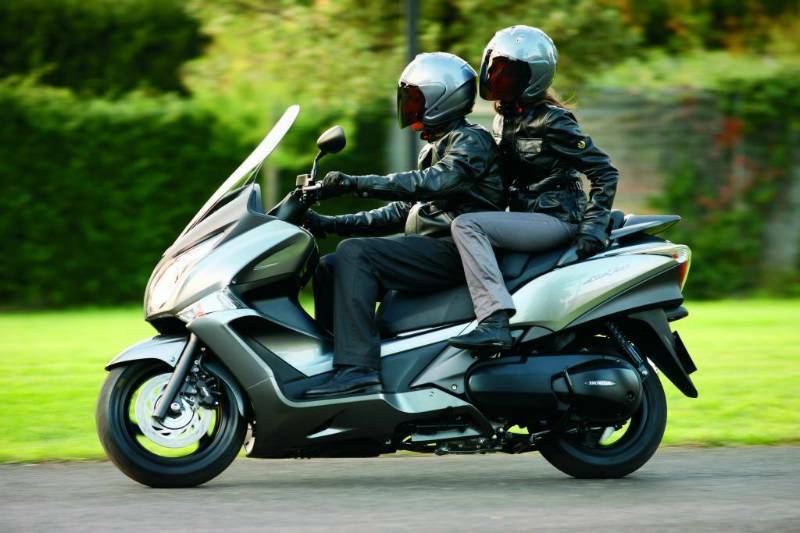 Available now from Honda Dealers nationally, the Silver Wing retails for $10,990 and comes in a black or silver colour scheme. BRP's Can-Am Spyder roadster has taken Australia by storm in its first 12 months, and now it is coming to a city near you! Starting in Sydney on May 1st 2009, BRP is launching "The Can-Am Spyder experience" demo tour. "The Spyder Experience" is a travelling road show including the "Spyder hospitality truck" that will visit cities all over Australia giving adventurers and enthusiasts the opportunity to experience first hand the Spyder roadster's unique features, ride characteristics, exhilarating performance, magnetic cornering and peace-of-mind stability. The Can-Am Spyder experience offers participants a two-hour introduction to the vehicle which includes rider training and technical overview prior to putting the Spyder roadster through its paces on the open road and feeling first hand the thrill of its unique riding sensation. Participants then have the opportunity to grab a coffee and discuss their experience with like minded adventurers, dealers and experts from the Can-Am team. To find out where and when you can register to try the Can-Am Spyder roadster, visit: www.spyderexperience.com. The demo tour is free. Register early, spots are limited. Bombardier Recreational Products Inc. (BRP), a privately-held company, is a world leader in the design, development, manufacturing, distribution and marketing of motorised recreational vehicles. Its portfolio of brands and products includes: Ski-Doo and Lynx snowmobiles, Sea-Doo watercraft and sport boats, Evinrude and Johnson outboard engines, direct injection technologies such as E-TEC, Can-Am all-terrain vehicles and roadsters, as well as Rotax engines and karts. Ski-Doo, Lynx, Sea-Doo, Evinrude, Johnson, Can-Am, Rotax, E-TEC and the BRP logo are trademarks of Bombardier Recreational Products Inc. or its affiliates. First quarter sales figures for the motorcycle industry have just been released by the FCAI, and although the expected decline across the board has impacted all manufacturers to some extent, Honda Australia is looking forward to a strong recovery in the coming months. Honda's General Manager, Motorcycles, Tony Hinton said sales will improve from this point forward as the company has taken an informed and strategic approach to ensuring the business remains strong. "We are confident that our remaining three quarters for the year will be stronger. We have done what is necessary to stay buoyant such as focusing on inventory management and planning for a different kind of market in the coming years," Mr Hinton said. "Honda wants to ensure that our dealers remain strong, and balancing their inventory in line with market conditions is a priority. It's about responsible economic management." Regardless of lower retail figures for the January to March 2009 period, Honda continued to have a strong presence in all of the major sectors such as ATV, Supersport, Touring, Enduro, Motocross, Fun, Farm, Trail, Naked and Scooter. "The two wheel industry can always bank on the fact that motorcycles are a fantastic option for people who are looking for an economical way to get around." "Buyer confidence and a willingness to make a discretionary spend on a motorcycle has started to show again in recent weeks, and I think we will see stronger sales for sectors that cater to the commuter market in particular in the future," he added. Honda is currently reviewing their product line up, and as a result, will be bringing in a number of new models before the end of the year aimed at meeting the demands of these new market conditions. Whilst bolstering sales remains important, Honda will also continue to remain focused on key matters that are peripheral to the retail sector. "We remain committed to expanding on our training and safety through our HART facilities, and in fact, will be launching the all-new Victorian centre next month," Mr Hinton said. "Honda also remains committed to working with Government to improve conditions for motorcyclists through our membership on key industry bodies." Figures released by the Federal Chamber of Automotive Industries (FCAI) show 26,241 motorcycles, scooters and all-terrain vehicles (ATVs) were sold to the end of March – a 15.5 per cent decline compared to the same period in 2008. “There are signs that the motorcycle market has softened in the past three months, however it has to be remembered that it is being compared to the record sales result of 2008,” FCAI Chief Executive Andrew McKellar said. “There are obvious financial benefits of motorcycle ownership and in these economic times people should look seriously at their transport needs,” he said. Road-bikes were the most popular segment in the marketplace recording 10,794 sales (6.8 per cent decrease) compared to the off-road segment’s 8,644 sales (19.6 per cent decrease). There were 3,807 ATVs sold during the first three months of the year (13.2 per cent decrease) and 2,996 new scooter sales (31.1 per cent decrease). “Scooters remain a fashionable, convenient and economical mode of transport but it is clear that the tightening economy has affected sales of this previously rapid growing segment,” Mr McKellar said. Yamaha was the number one selling brand in the marketplace with 5,197 first quarter sales, followed by Honda with 4,917 and then Suzuki with 3,763. Looking at the segments in more detail, cruisers retained leadership of the road-bike sub-segments ahead of 250cc and sports. Harley-Davidson led the road bike segment with 1,902 sales, followed by Suzuki (1,834 sales) and Honda (1,775 sales). In the off-road market, Yamaha was the clear leader (2,552 sales) from Honda (1,996) and Suzuki (1,311). In a declining market, SYM was the leading scooter brand with 517 sales ahead of Piaggio (385) and Vespa (376). ATV sales were led by Yamaha with 1,085 sales, then Honda (843) and Polaris (633). The first phase of work is nearing completion on the massive site in Melbourne’s north that will become the new location for Honda Australia Rider Training (HART). To celebrate the training centre’s Grand Opening at 200 Sydney Road, Somerton, HART is hosting a public event on Saturday, May 16th from 9am - 4pm, including an official ceremony at 10.30 am. HART has long been considered the preeminent provider of rider training and licensing in Victoria, and will now boast two massive road ranges allowing for both novices and experienced riders to obtain realistic road speeds and situations. In addition to learners, licence, intermediate and advanced road riding courses, the new facility will also offer off road training for kids and novice adults, as well as ATV training on a purpose built track. “This is one of the most exciting developments since HART’s initial opening 20 years ago,” said HART National Manager Mark Collins. In addition to the formalities on the day, the Grand Opening will include free “Try It” sessions for beginners and experienced Riders (bookings required ahead of event on (03) 9335 2766), $50 off any course booked and paid for on the day (subject to availability), and free demo rides of the Honda road fleet (bookings required on the day). HART is also promoting the wearing of protective clothing through the sale of discounted riding gear on the day. Further highlights will include a free sausage sizzle at lunch time, Riding Simulator sessions conducted by senior HART instructors, and road, off road and ATV demonstrations. For more information, please visit: hartridertraining.com.au. New South Wales Premier Nathan Rees visited the Honda Australia Rider Training (HART) facility in St Ives recently to announce a new licensing scheme for motorcycle riders. The scheme, to be introduced in June, is similar to a motor vehicle licence and is designed to give riders more time to gain confidence and experience on the road. “We’ve extended the minimum provisional period for motorcycle riders from one to three years, with the same P1 and P2 phases as car drivers,” said Mr Rees. NSW Roads Minister, Michael Daley, was also in attendance at HART, which was chosen for the launch dues to its international standing as a provider of high quality motorcycle learner and licensing skills programs. “Riders must now hold a learner licence for a minimum of three months before attending a pre-provisional course. They must then be on a P1 provisional licence for a minimum of 12 months before applying for a full licence,” said Mr Daley. Honda is heavily involved in rider training, with four facilities located in Queensland, New South Wales and Victoria. “Whilst we wholeheartedly support training programs designed to make riders safer, it will be interesting to watch what effect the new licensing scheme has on accident rates and crash data in New South Wales,” said Honda Australia’s Managing Director Stuart Strickland.